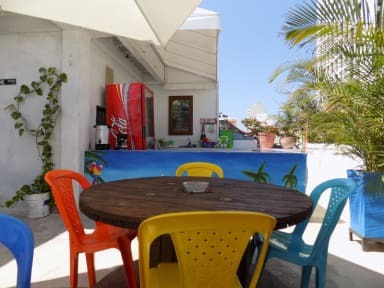 The hostel has a unique style alluding to the Caribbean Sea and local culture, it is an ideal place for travellers looking for variety in one place. Caracoles Hostal offers a total of 10 bedrooms between dorms and privates, wireless internet service, terrace for meals, terrace bar and tanning terrace from witch you can see the San Felipe de Barajas Castle. The reception service is 24 hour and shared kitchen with limited hours. in Getsemani you can visit La plaza de La Trinidad, a square where locals meet every night, with travellers (national and foreign) who are passing through the city, and where it is common to find, especially on weekends typical local food, as well as varied forms of cultural expression. 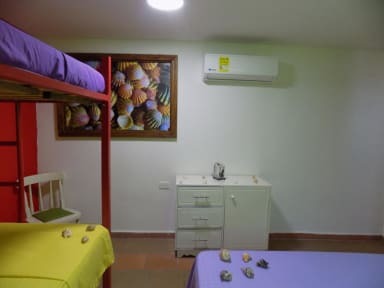 Caracoles hostal offers 10 comfortable rooms between dorms and privates, all with air conditioning, wireless internet access and a characteristic decoration of the region guaranteeing your rest and relaxation. I had a great stay here! The staff were all really friendly and welcoming. The facilities are quite comfortable. The multi-level terraces are nice and there is a bar there. The free breakfast is small but adequate. The A/C in the rooms is fantastic, but the temperatures can swing drastically based on who has the remote control - it’s just left in the 18 person dorm for whomever to control (might be better if the staff just kept it at a set temperature). I would definitely recommend this hostel. Never stayed in a hostel before and wasn’t sure what to expect. Toilet stalls are very small and there was no soap in the dispenser but I met a lot of great people to spend New Years with. The staff is very friendly, helpful, and understanding of nonspanish speakers. Rooftop common space has a great view of the Castillo de San Felipe to see while eating a delicious breakfast. Good walking distance to a lot of places. Highly recommend. Good hostel close to historic centre with rooftop terrace where you can take breakfast. Overall a good place to stay. The room didn’t have any windows but was ok as we were only there for a night. Great location, close the old city. There were only 5 of us in the 18 bed dorm which was awesome, if there was more it would have been cramped. The breakfast was all good. The staff were great, I needed to go to the hospital while I was there and they helped me get there. We returned after check out time and cancelled our remaining two nights so we could stay in a hotel with a private room close to the hospital while I recovered and they let us do that with no charge. Good value for money. My first ever hostel stay at the age of 57! Persuaded to try hostel-life by my son, having spent the last 30 years always staying in 4*+ hotels. This hostel made me wonder why I have spent all that unnecessary money over the years. The room was clean and functional (I did have a private en-suite room, I'm not going to subject dorm mates to an old, farting man in the middle of the night and it's really not a pretty sight in the morning! ), more than adequate for my purposes, would stay again. Dead basic.. very friendly staff but no English spoken (our problem not theirs). Freshly cooked breakfast of coffee.. scrambled eggs toast and fruit.. better than some we’ve had! Hard lumpy bed .. only cold taps so no hot water but seriously hot there, so once over the shock was quite pleasant! Ok to use as a base but don’t expect any frills. Overall a fine hostel. Location is okay in getsemani, not far from the center. Supermarkets nearby. Staff were friendly and helpful. The prices in Cartagena are so high that you don’t get much value for money. We actually booked 4 nights here but went to a nice hotel with pool the last two for the same price on Booking.com. Rooms were ok, AC was good and they had a large terrace. The kitchen is ok equipped, But is outdoors, so you have to fight the ants. Good location close to old city and restaurant area. Good aircon and clean room. Breakfast ok, wifi didn't work during our stay. Overall good value and would stay again.